A bathroom is the room that your guests will visit for sure. The guest bathroom will tell them a lot about you. Your master bathroom is the place where you get ready to face the day, where you unwind at night, your sanctuary. Whether you only change the tub and faucets, or you retile and also redo the cabinets, countertops and of course the plumbing, we will work with you to achieve what you want. We will discuss the use of the bathroom and what you want and need. This room is really the jewelry piece of your home. The latest trend is to remove a tub from a bathroom and turn it into a shower, or to remove a soaking tub from a master bath and replace it with a walk-in shower, or make their existing shower larger. We will work with you to see if you can make your shower larger or add a linen closet. The powder room or half bath is really the bathroom that most people want to fix up first, since it is the guest bathroom. 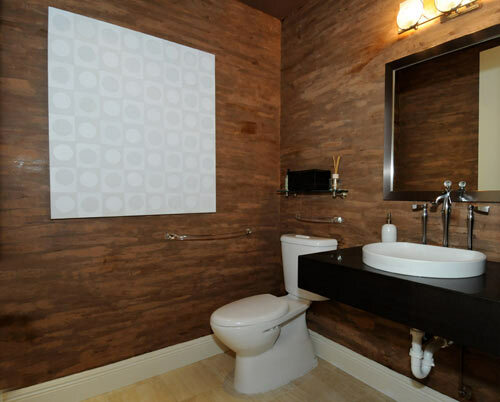 This is where you can put that antique vanity, or a real contemporary floating countertop, you can faux the walls, use an interesting sink, a beautiful faucet with some extra bling on it and even use a new dual flush toilet. It is the conversation piece room. The master bath is next in line for construction. Everyone wants their own space, and they want to make a larger shower, or change a soaking tub into a jetted tub. They may add a closet if they need extra storage space or remove one to make the bathroom larger. Lighting becomes an important factor in this room; it will help to create a peaceful feeling. The possibilities are endless, but most requests are not unreasonable. So, do not be afraid to ask if something can be accomplished. In our company, most things can and will be done for you!